Weakness in the gluteus maximus and gluteus medius is often cited in contributing to patellofemoral pain, IT band problems, hip pathology and even back pain. Furthermore, activating the glutes and minimizing tensor fascia lata (TFL) activation is preferential to avoid synergistic dominance with abduction exercises. This is a common finding on my clinical exams. In the February 2013 issue of the Journal of Orthopaedic and Sports Physical Therapy (JOSPT), Selkowitz et al. 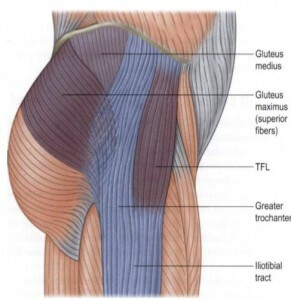 examined several exercises to determine which ones had the highest gluteal-to-TFL muscle activation (GTA) index. The clam exercise proved to be the best with an index value of 115. 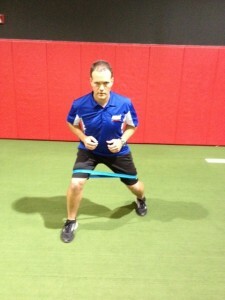 The second highest exercise was a sidestep with elastic resistance with a value of 64. The other three exercises to score a GTA index of 50 or higher were: Unilateral bridge (59), quadruped hip extension w/knee extended (50) and quadruped hip extension with knee flexed (50). Below is the clam executed against a wall as described in the study referenced. Additional research done by Wilcox and Burden (published in the May issue of JOSPT) suggests that a neutral spine alignment and 60 degrees of hip flexion is the best position for gluteal activation during the clam. This study was done without resistance but offers additional insight to positioning. I try to mimic this hip flexion angle in the standing single and double leg versions I employ with mini-bands as part of my gluteal activation series in the clinic as well. In the Selkowitz study, participants performing the sidestep were instructed to step to the left replacing 50% of the distance between the feet in the start position and follow with the right leg also stepping at this 50% increment. This was then repeated to the right to return to the starting position for a total of 3 cycles. This exercise has one of the lowest TFL activation and reinforces proper frontal plane mechanics and can be used with clients and athletes to reduce anterior knee pain and injury risk. To increase resistance and/or difficulty, bands can be moved to the ankles or a band can be applied above the knees and at the ankle. In my practice, I typically have clients sidestep for 10 yards in one direction (using the 50% rule) and then repeat moving back to the other side for 10 yards. 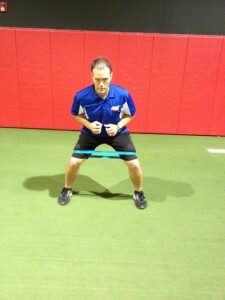 Another option is to perform the sidestep exercise with a staggered stance. For example, lead with the right leg forward moving to the right and vice versa. Again, small steps replacing 50% of the original stance is best to ensure quality work. I’m a DPT involved with youth sports. I love your stuff, keep it coming. Want to meet up some day and discuss business oportunities. Thanks Jack – appreciate the kind words. Glad you are involved in youth sports and always welcome the opportunity to meet like minded professionals! Thoughts on activating a stubborn glute med after a proximal femoral resection and reconstruction? (Had a large sarcoma removed, as well as my ischium and a portion of my femur and hamstrings)… I’m on month 8 of outpatient PT and despite all clever attempts to come up with new strategies for activating glut med, it’s only responding about 50% of the time and my TFL appears to be taking over in most cases. I’m ready to ditch my crutch! I welcome any ideas/input! I use lots of exercises including the ones in this post. I also like mini-band bridges (band above knees), single leg bridges, single leg squats, single leg cone reaches, single leg stiff legged deadlifts, etc. You may be doing all or some of these. The sidelying plank with hip abduction is another great one. Click here for more on top 10 glute activation exercises.